Will Davis just kept on rolling, while a fellow Artesian joined him in the winner's circle, in exciting JBT NM-TX Conference action at Albuquerque's Holiday Bowl. After qualifying, bowlers competed in 'super survivor', where the low score and low overall total are eliminated game by game. With four bowlers left in scratch, Zach Harvey blasted 264 to lock his place in the title game, Dante Uribarri bowed out with 168, and Davis snuck into the title match by just staying ahead of Harley Sweigart in total pins, +129 to +114. Zach looked to be on his way to ending Davis' three tournament winning streak, but a tenth frame split opened the door for Will. Needing a mark and fill, Davis flushed ten back for his fourth consecutive JBT win, and sixth career JBT title. He could equal Dallas Leong's record of six straight wins in Pojoaque next month- stay tuned! TJ Thalman earned a huge pinfall lead by the time four handicap bowlers remained, and avoided the low game pitfall to reach the finale. Kara Thompson emerged from a group of three closely packed ladies, staying ahead of Taylor Herson and Angela Romero to reach the title game. Kara bowled a very nice clean 200 in the title game, but TJ was only a little behind that, and the handicap difference was plenty to overcome Thompson and earn him his first career JBT title, joining his high school state champ teammate Will as JBT champs! 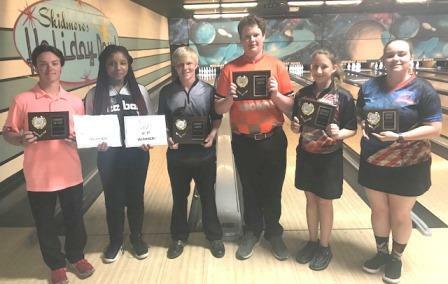 Robin Prioleau was clutch in the subdivisions, doubling in the tenth to shut out Josh Williams 200-197 for the U17 win, and doubled in the tenth to beat Morgan Ellis 175-172 to win the Priority Girls Scratch event! Big thanks to the whole team at the spectacular new-look Holiday for their usual great hosting job. Want in on the fun? Just come on down to the next JBT event!